These soccer goalie drills are for the more advanced youth player and young adults. This is where a player becomes to realise that being a goalkeeper is an important soccer position and one which they would like to play every game. If you feel these drills are too advanced or you would like to see more more soccer goalie drills then click on the 'goal-keeping' tab to the left and choose 'beginner' or 'intermediate'. Start off (as always) with some basic ball handling techniques. Get each player to do ankle rolls, ball movement juggling and quick feet movement like a crab where they are on their toes, weight forward hands together in catching position and head still. Remember, if a ball is dropped the player should quickly dive on the ball and instantly get two hands to the ball. For the older players there should be no mistake with this and should now come with relative ease. For other basic ball handling techniques check out the 'beginner/intermediate goalie drills' from this website. In 'Intermediate goalie drills' we looked at the various different rolls and throws that a young goalkeeper and more advanced goalkeepers should know. Two other important parts to goalkeeping is punching the ball (when a cross is made for example) and kicking the ball both static and in hand. Fist Punch - It is not always possible to collect the ball comfortably with two hands. There may be players around you obstructing you or the ball may be coming too fast. 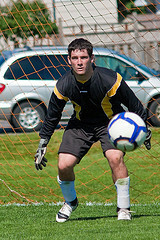 In this instant a goalie should make a fist with there stronger hand and punch the ball to a safe area away from goal. This is particularly useful as it gives you extra height then catching with both hands and means you can get higher than the opposing players around you who are looking to head the ball. Palm Push - As with the fist punch, it is not always possible to gather the ball with ease and the palm push allows for the goalie to push the ball away if it is traveling fast, is wet/moving in the air or players obstructing. Unlike the fist punch, this is good for helping the ball on its way. For example, if a shot comes in above a goalies head they should use the palm to push it over the bar and help it on its way. The same for a cross from the side when there is a lot of people in the box, a goalie could reach above and push it over to the other side of the field where the natural momentum is. Static Goalie Kick - It is difficult to coach the kicking of a static ball. The ball is placed on the corner of the 6 yard box and kicked as far as possible typically high out wide or up to a tall attacker. Another option is to pass to a defender if there free and allow play to start from the back. To gain maximum height/distance a goalie must use their kicking leg as a pendulum which starts at the back and comes all the way through making contact with the ball half-way. The leg must then carry on through its kick to gain power. Kick the ball with the shoe laces/side of the boot area getting toes under the ball. On the above diagram you will see that there are 3 separate soccer goalie drills. One at the very top, one in the middle and one toward the bottom. This drill is all about working hard and making those vital saves which can stop a goal being scored. You will see that there are two goals. The goalie (in orange) must hurry between each goal and save the shot being kicked at the goal by a coach/player (in red). The coach/player must wait until the goalie is close to the goal before shooting, after a few goes swap around with another player as this is a very tiresome game. The goalie (in orange) will start behind the furthest left cone and then run diagonally to the next cone and place one hand on the soccer ball next to the cone. They will continue to weave between each cone placing one hand on the soccer ball at each stop as quickly as they can until they come to the goal at the end. 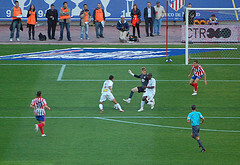 The coach/player (in red) will then try to score past the goalie in the goal at the end. This drill is good because multiple players can proceed each other with this drill. This drill is really fun and one that I play with older kids at the end of a session. It is also really useful to see how technically aware they are when put into a game scenario. The idea is simple, line up all the goalies (in orange) you have at your disposal behind the cones and one by one they will jump over the cones, get themselves into their goalkeeping position and do a diving save to stop the soccer ball kicked at the cones (from coach in red). The aim of the game is to get as few cones knocked down as possible at the end. - Goalie faces the coach (6yds away) in position with hands ready. Coach kicks the ball out of hands toward goalie who brings the ball into their body firmly. Progress from this by having the goalie stand sideways on and the coach shouts 'go!' to which the goalie quickly faces forward and coach kicks once more. This also works well with the goalie facing in opposition direction to the coach and having to do a quick 180 degree turn. - Goalie starts in goal and the coach has a ball 25yds out. The coach dribbles toward goalie who rushes off their line and attempts to make a block tackle using hands/body/feet depending upon scenario. Progress by having goalie start lying down or sitting down for an extra work-out. - The coach crosses in balls from a wide area and the goalie must catch the balls with both hands or if unable to do so must palm the ball/punch the ball away to safety. See Other Soccer Goalie Drills Here!